Mining scrypt with payout in LTC. I have two identical Antminer L3+'s. One is pointed to prohashing and the other to litecoinpool.org Not totally sure if this is the right place to post, but it seems to indicate a trend to me. 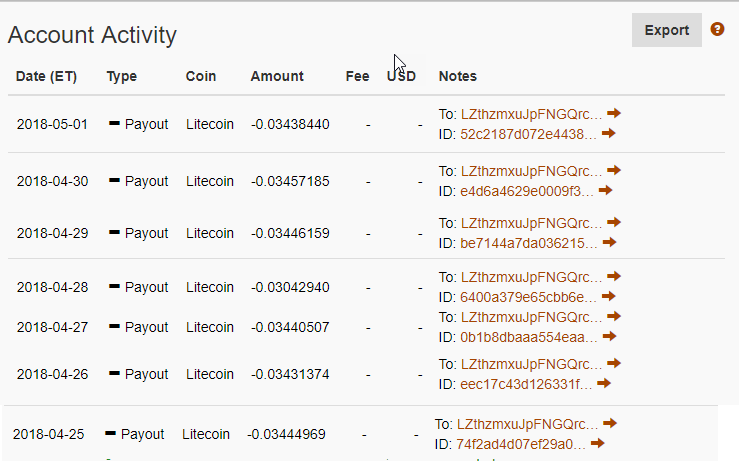 Been running for the past week and payouts at litecoinpool.org are reasonably higher. I didn't expect that based on how prohashing works. Difference is 0.015252 over 7 days. based on the current LTC price of about $147, that's 32.0284 cents per day or $9.60 per month which is about 6% less than litecointpool. Seems pretty significant in the long run. Am I doing something wrong? Or is this evidence that prohashing really cannot compete if you are just interested in a single coin payout? Re: Mining scrypt with payout in LTC. That's correct. It's really not worth it if you are getting a coin in the same algo as you, otherwise you can make more elsewhere. I put my L3+ on litecoinpool since i get more money there and i want litecoin, whereas i will put my x11 or sha256 miner etc. if/when i get them on here since it'll payout in litecoin and i won't have to do the conversion myself, and probably after conversion costs, might actually end up with more here. Last edited by Aura89 on Wed May 02, 2018 5:18 pm, edited 1 time in total. Those numbers look to be what I've always seen. Even after the new exchanges were added and with the recent update today I am guessing stops paying people for stale shares already found will actually lower the payout people were getting and making that go down a bit more in the comparisons. Prohashing was never intending to be the most profitable, which is what I am looking for bottom line, they offer a unique service of allowing you to mine in one coin and get paid in another. But when the site sales coins that you mined in order to pay you the coins you want, and I am guessing they arent over a year old, someone I think needs to pay that US legal business tax on selling their coins. I can't see the site taking a 33% hit just to stay in business, so are the miners the ones paying for that conversion tax? I mine a verge coin for $1, and .66 of that goes to buy the litecoin the other .33 goes to pay the taxes on selling the old coin? I am guessing not enough LTC are being found, so the coins mined have to be sold undervalue to be sold and LTC need to be bought probably for more than they are worth...is the high-low sale values where the money is being lost from? It used to be PH was higher on days when there was a difficulty rise on the LTC network, the last 2 rises that hasnt been true either. CSZiggy wrote: Those numbers look to be what I've always seen. Currently, we're waiting to see what happens as a result of not paying people for the stale shares caused by the parallelism issue. Before, the result was that static coin miners could earn more than they should have because they could mine very easy coins, where blocks flew by, and where they were able to earn credit for the same blocks on other servers. That caused a larger portion of the pool's profits to be earned by static coin miners than should have been earned. We need several days of data to determine the effects of the change, since coins like litecoins don't see blocks found very frequently. Once we have the data, we intend to relax some constraints, which will increase the profits of both types of miners compared to current profits. Static coin miners will still make less than they did a week ago, but dynamic miners will earn more. Thanks for the feedback... I had always thought that in the end prohashing was more profitable because they were attempting to mine the most profitable coins at that point in time but I guess all the conversions to and from the different coins ends up killing those profits. I still see value in prohashing but not in the way I did before. I think with my 4 L3+ its more profitable on PH, I connected mine to LTCPool yesterday when PH was having issues and with an app it was showing $17 a day but on PH I get between $20 and $23 but that depends on LTC which seems to be only on a sideways trend at the moment and hasn't had a massive change in value for a while. The biggest issue with LTC and LTCPool is difficulty of block, when I started 2 months ago it was at 45mil now its at 90mil so mining other coins with lesser difficulty and getting paid in anything you want must be better so I think PH is worth it atm. Darzl wrote: The biggest issue with LTC and LTCPool is difficulty of block, when I started 2 months ago it was at 45mil now its at 90mil so mining other coins with lesser difficulty and getting paid in anything you want must be better so I think PH is worth it atm. If the pool ever mined anything else, really it's mining LTC most of the time by most of the miners. And since it doesn't find many LTC it has to sell coins and buy coins and that conversion loss is what makes the profits here less than taking a percentage of what is found at the other site. .037 coins at litecoinpool > .031 coins at PH. I've checked every weekend after major internet and updates and new exchanges were added. One weekend on a saturday there was a difficulty increase and PH almost tied LTCpool, but that was almost and the rest they have been around 10% lower. Darzl, go back, put 2 machines on each site, see which pays out more coins in 24 hours. Doesn't matter what the price of the coins is, the more coins you get the more profit you get. See if you get the same numbers Dave got. CSZiggy, This is good advice - I will do a test over the bank holiday with mine. I have to admit that I go thrown when I spotted a nicehash profitability of just 0.02 for 504 mh. At LCP I was on about 0.04 at the time, and even allowing for difficulty increases it should be higher. Darzl wrote: I think with my 4 L3+ its more profitable on PH, I connected mine to LTCPool yesterday when PH was having issues and with an app it was showing $17 a day but on PH I get between $20 and $23 but that depends on LTC which seems to be only on a sideways trend at the moment and hasn't had a massive change in value for a while. I think you were paying too much attention to the USD value, which has been fluctuating quite a bit. What's important is the LTC amount. I've done the test multiple times, coming back to prohashing, using it for a couple days, trying to make sure it actually is paying less, and i come to the conclusion each time that it is. Then i go back, and confirm that it is. I hope one day it'll be more profitable like before december, but currently, it's not. The most irritating thing about this though is that the graphics on the front page always show that it IS more profitable then just simply mining ltc....but it's never correct. Aura89 wrote: The most irritating thing about this though is that the graphics on the front page always show that it IS more profitable then just simply mining ltc....but it's never correct. and if you omit the c= value and go autopool you would have earned that much more on the PH autopool pool. It's not comparing how much you can get mining straight LTC at other places, only relative to here on this pool.